In 1892, James Ross, an entrepreneur of the Canadian Pacific Railroad, commissioned renowned architect Bruce Price, who also designed McGill’s Royal Victoria College and the Chateau Frontenac in Quebec City, to build a house for him on Peel Street on the Square Mile. 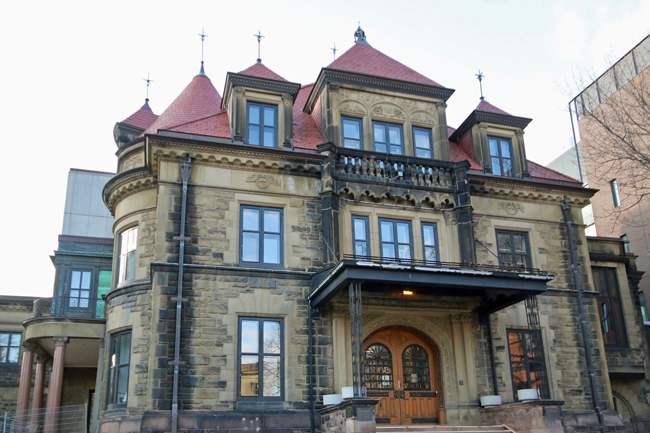 The house, with its two circular turrets and larger central tower, was constructed of Credit Valley limestone and was designed in the French Chateau style. John W. McConnell bought the Ross Mansion in 1948 as a gift to McGill. At this time, it was renamed Chancellor Day Hall, after one of the University’s first Chancellors, and was given to the Faculty of Law, which still occupies it today.